Flight 300, headed for Los Angeles from Kennedy Airport, had 101 passengers and eight crew members on board and no one was reported injured, the airline said. 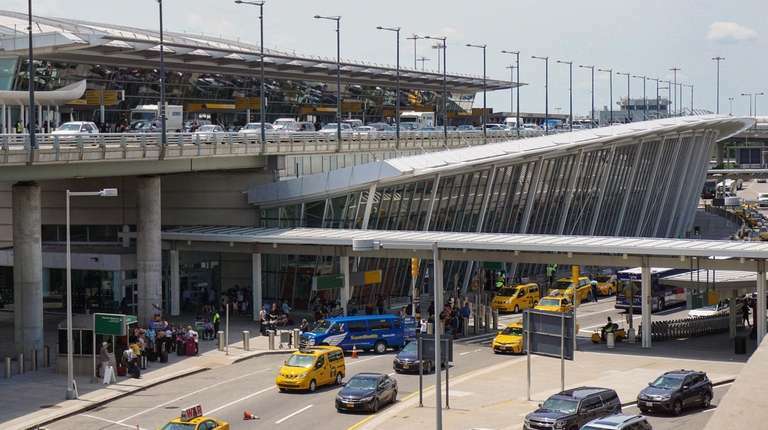 An American Airlines flight made an emergency landing at Kennedy Airport on Wednesday night shortly after takeoff when the jet struck a sign on the runway, according to the airline and the Port Authority. Flight 300, headed for Los Angeles, may have veered off its path when it hit the sign designed to guide pilots down the runway, said a spokesman for the Port Authority, which operates the Queens airport. The flight, carrying 101 passengers and eight crew members, took off at 8:40 p.m., the airline said in a statement. The aircraft landed safely at Kennedy at 9:09 p.m., with no reported injuries. The plane went sideways after takeoff and the pilot had to straighten it out, a passenger told ABC7 Eyewitness News. "The plane veered left when it hit something and then it took a sharp right turn at takeoff where I was on the right side of the plane and I was looking straight down at the ground," said Scott Laser, according to the report. "I cried the whole way back and many others did also."